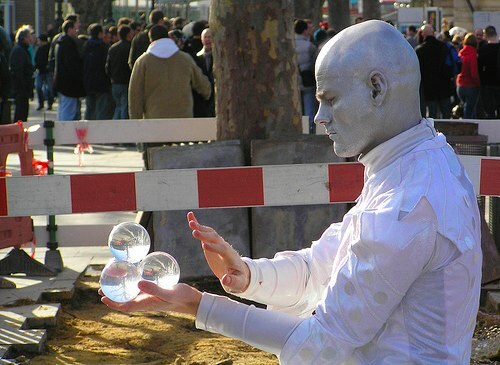 There was no-end of photos with Crystal Balls on Flickr’s Creative Commons search. If the first pages, I almost picked this, this, and this. I just scanned CogDog’s piece on making new year predictions (This the Season of Predictions) and have ReadWriteWeb, and Stephen Downes loaded in my queue (see Levine’s blog post for other links). I don’t really care about predictions at this point. I do not really wonder if they’re right. The value is in the insights and advice that they carry. What I care more about is what we all care about. That is to say, I’m interested in what you care about — what do you hope we, 12 months from now, will be able to say about 2009. I hope that 2009 is the year that NCLB starts its much needed complete overhaul — or complete replacement. I hope that we come to realize, in 2009, that digital and networked content for teaching and learning is actually less expensive than printed paper — and far more effective. So, what do you hope we’ll be talking about in 12 months? 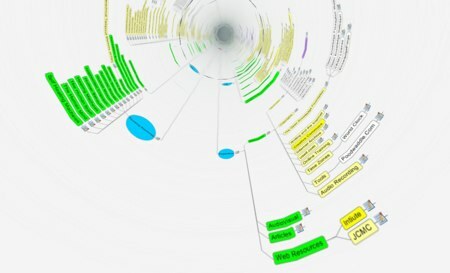 Picture of SearchMe Stack with videos of multitouch technology. In a December 23 article, Technology Review writer, Kate Greene described three technologies that have received special attention this past year. The first, I find interesting today, because of mention that Greene makes of a do-it-yourself (DIY) spirit that has emerged around it. Most of us were introduced to multitouch through our iPhones. But the real potentials were illustrated by Microsoft’s Surface device, and the slew of videos that popped up on YouTube demonstrating the technology. Here is a SearchMe stack of other MT videos. There’s little that is really new about multitouch technology, except that it has become cheaper. Nordt, a research studio (I like that term) in New York, now offers a product called TouchKit. With this $1,000 kit, anyone can make and modify their own touch-screen table. In a referenced article, Greene writes about Addie Wagenknecht [Eyebeam Profile, Wikipedia Article] and Eyebeam’s project called Cubit. She and Stefan Hechenberger wanted to illustrate how anyone could build a multitouch table with a few simple items — for $500 to $1,000. Here is a video demo of Cubit. Computer memory has also taken some interesting twists during the past year, especially with the appearance of the “popping up all over technology conferences” netbooks, many of which utilize flash memory for long term storage, rather than hard disks. Greene talks about some advances that were talked about this year, and will likely starter emerging as early as 2009. The first was phase-change memory, “..which stores data by altering the crystal structure of a material (rather than using the charge within transistors)..” Samsung and Swiss startup, Numonyx, have already started sending test samples to gadget makers. It seems that information devices might be getting even smaller. Makes my head hurt! Microprocessors are also seeing advances, partly stemming from our new love affair with anything green. The most notable development is Intel’s Atom processor, a low energing chip that is appear in small notebook (netbook) computers and some handhelds. But to take things even smaller, researchers at the university of Michigan have designed a chip for small sensor applications. It uses 30 picowatts (one million millionths [10-12] of a watt) (( “Picowatt.” Wictionary. 2006.Wikimedia. 29 Dec 2008 <http://en.wiktionary.org/w/index.php?title=picowatt&oldid=1917664>.)) of power while idling, and only 2.8 picojoules (one million millionths [10-12] of a joule) (( “Picojoule.” Wiktionary. 2007. Wikimedia. 29 Dec 2008 <http://en.wiktionary.org/w/index.php?title=picojoule&oldid=4539693>.)) per computing cycle. Probably means no more to you than it does to me. But the thing could be powered by a battery no bigger than it is. Read more about wireless advances, and mobile mania at The Year in Computing from Technology Review. Each year, the division, where I worked, at the North Carolina State Department of Public Instruction, held a Christmas potluck gathering for current and former employees. It was something I looked forward to, visiting and reconnecting with colleagues who have moved on to other jobs or retired. It was also a chance to enjoy regular dishes, such as John Brim’s amazing Cheese Cake and Margaret Bingham’s Collards. For me, it was Tiger Butter, and I was promised each year that I would not be allowed entry without it. This year, however, the division has been absorbed into other groups at DPI, due to a restructuring — which seems to be a defining characteristic of all state government. As a result, there was no potluck this year and no excuse to make Tiger Butter. Not to fret, I made some yesterday so that we could mix it in with the roasted nuts that Brenda traditionally prepares for neighbors. In keeping with another tradition, I am sharing the recipe that I use with my friends. It’s easy and oh so good! Combine white chocolate and peanut butter in top of a double boiler; bring water to a boil. 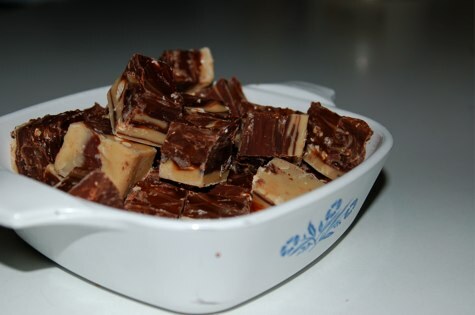 Reduce heart to low, and cook until chocolate and peanut butter melt, stiring constantly. Spread mixture onto a waxed paper-lined 15- x 10- x 1-inch jellyrool pan. Pour semisweet chocolate over peanut butter mixture, and swirl through with a knife. Chill until firm. Need a stress breaker or are you stuck in the house due to all the white stuff everywhere? Log in to Second Life and play the Happy Holiday Hunt with PBS Teachers! Many of the follower of my 2¢ Worth blog, already know that we’ve added a second web server to the Landmarks setup. I guess we have a sever farm now, though it’s really more of a server backyard garden. But even at that, Citation Machine was stressed off and on through the end of the fall semester. So, over the past few weeks of not traveling, I’ve been working on some new programming for CM that breaks it loose from the databases. Now, all of the coding is resident within the program itself and various config files. What this means is that it should run faster. If you have already registered, you can use this page to login. If not, type your name and e-mail address, make up a username and password, and select your location. Go through the process of generating a citation. When completed, you will see a [Save this Citation] button at the bottom of the page. Click this. 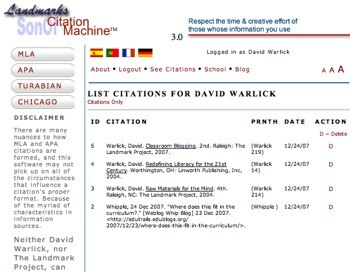 To view your citations, click [See Citations] at the top menu. From here you can get a listing of the citations with dates generated, or click [Citations Only] to view a copiable version. I was mostly speechless yesterday, upon opening Twitter Deck and finding a slew of congratulations. 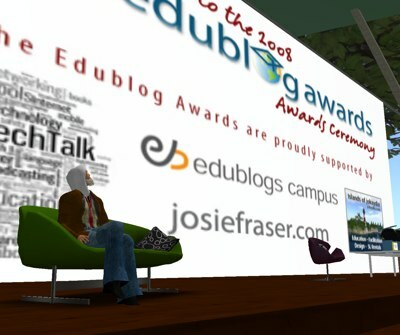 I refused to believe it at first, but, upon clicking through to the EduBlog Awards and then the link to The winners have been announced... Well there it was. I’d received a Twitter congratulation a few weeks ago, my first and only known notification of being nominated for an Eddie. It wasn’t my first nomination, but when I clicked in and saw the others considered for Lifetime Achievement (Stephen Downes, Scott Leslie, Will Richardson, Nancy White, Chris Lehmann, Graham Wegner, Michele Martin, Jay Cross), well I simply put it out of my mind. Then, I awoke yesterday morning to a stream of congratulations on winning the Eddie (it’s heavier than it looks). My immediate throught was the Woody Allen line in Annie Hall, “Any club that would have me as a member…” Of course, this notion didn’t last very long as I scanned the list of other winners (to the right), discovering the company I am keeping. The winners of the 2008 Eddies are…. The thing that gives me relief (and concern) is that when I think of a Lifetime Achievement Award, I thing of an old guy, gray hair, forgotten by most, shuffling up to the stage bent over a cane. Of the other nominees of this award, I am certainly the closest to retirement, at least as you do the math. In fact, it occurred to both Brenda and I that this may be a not-to-subtle hint. Screen capture of Second Life™ channel of the awards event, from Josie’s blog. My extreme apologies to Josie Frazier, Dave Cormier, Jeff Lebow, James Farmer, and Jo Kay for missing the awards event. 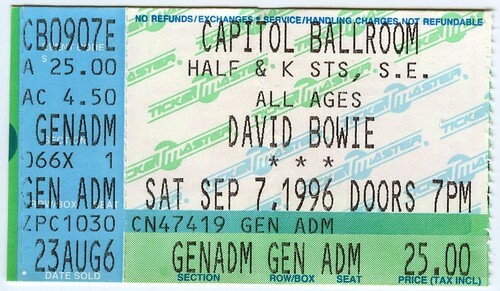 Again, I’d tuned the whole thing out, in an effort to avoid disappointment. I would also have been dreadfully under-dressed. All of that aside, I am very proud and even more honored by this award and will wear the heavier-than-it-looks badge on the right panel of all of my web sites. …and a very special thank you to all of my relatives for voting. Counting uncles, aunts, cousins and quarter cousins, this comprises most of the populations of Cher’ville, Delview, Little Waco, and portions of Crouse (up to O’Dells Spit-n-Wittle Handy Mart). This was only one of the interesting things I learned this morning through the “tech tab” on AP Mobile News Network, my favorite iPhone App. To start things off, the December 19 story, Music Industry Drops Effort to Sue Song Swappers is a welcome and much anticipated indication that the music industry may be realizing that to survive in this new information landscape, they will have to adapt. The next story that caught my attention provided more evidence — Music Sales Rise in Harmony with Game Appearances. The story speaks most directly to two video games that, if you have not heard of them, it can only be because you’ve spent the last two years sequestered in a monastery behind the tallest peaks of the Himalayas. 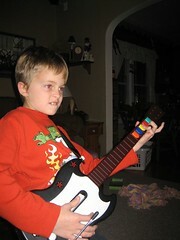 If you have spent the last 730 days in meditation, Guitar Hero and Rock Band are two games that come with plastic guitars and drums, connected to the game system, and programmed for you to play famous and gut-throbbing rock songs, by watching musical notes (so to speak), scroll your way. You miss notes, and you lose points, to the disappointment of the other members of the band. There is no message in this from a direct instructional intent. But what it reminds me of is how important this world of video games has become. It is being integrated into a greater economic engine, and it is a part of our children’s foundational experience — the good and the bad. It simply means that we, as educators, young and old, need to be paying a lot of attention to this. As some of you know, I’ve been tweaking CB for the past few days. It’s my way of relaxing. We are coming up on Christmas time, where my mind, now into its sixth decade, still goes to play. When I was a child, it was Legos and a wild array of other building toys. Today, it’s PHP code. Its the same experience, except that the bricks I have to build with are numberless — limited only by my imagination. ..We have moved next door to to a classroom with a different view. The first picture is now on the Room With A View part of our blog. It’s a picture of something else that is changing at our school at present. 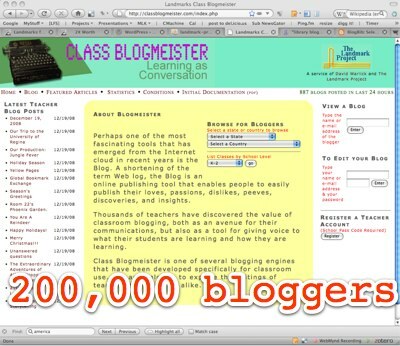 What impresses me is that I typically think of Class Blogmeister as a set of blogs. My imagination, with regard to its instructional function, has not strayed beyond the individual teacher or student blog. Yet Carolyn Knight has extended the function, extended her voice, and extended the potentials for learning experiences for her third and fourth graders. This is why I build Class Blogmeister. 6,664 Blogs posted in the last seven days. It is all about audience. My students can tell by the “reads” feature that people are reading their writing and it inspires them to write and to write better. They are participating in a read-a-thon for which they have to obtain sponsors who donate by the number of pages they have read. The students prove that they are reading by blogging about what they read. Sponsors can follow the kids’ progress by reading their blogs. Students also read each other’s posts for ideas about what to read next. 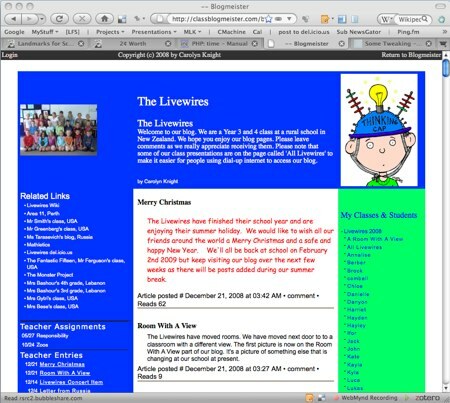 (Blogging) is a cornerstone of my library instruction this year. CB has increased my students’ motivation to complete and participate in assignments that would ordinarily be completed with traditional paper and pencil. The work they complete serves an authentic purpose that can be shared amongst not just their peers but world wide. This is my first year of blogging with my second graders. I am so pleased with their excitement over using the blog. I have already seen improvement in their writing skills. People are starting to show up — that is, avatars are starting to gather. Last night was interesting — and you know what the old Chinese wise man said. 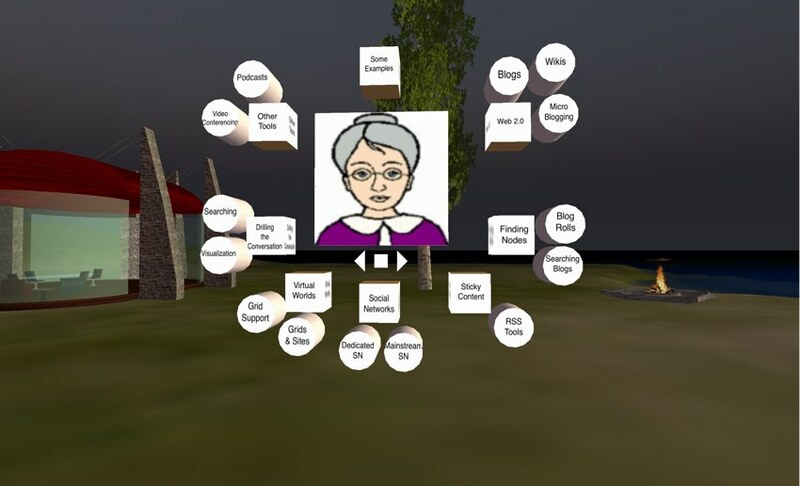 It was a new experience for me, to present to an audience of Avatars in Second Life, and I want to thank Lisa Perez and the AASL – ISTE SIGMS learning community for the invitation. The challenges were many for me, as a person who is not exactly at home in the virtual realms. First of all, the participants were avatars, appropriately dressed and polite (no giant yellow ducks), but puppets none the less. Now multiply any discomfort by a million when you consider that most of the people who are driving the avatars in front of me were actually out-of-body, experiencing the event from many different angles. I wondered earlier this morning if it would help to reflect this element of the experience by having ghosts of the avatars appear in varying degrees of transparency. Although I would have had a more accurate sense of the environment I was speaking into, the spook factor put that thought out of my mind in a nanosecond. A large part of the event was to be handled as discussion, which was also challenging to me. The few folks we got on with voice worked out well, I thought, and was especially pleased to have Peggy Sheehy expand on a new blog she is authoring for the teachers in her school. I do not know how many people were sitting around me, but I found the chat to be advancing to fast to gain any usefulness from it. Of course, none of this was bad or in any way a barrier to the potentials of virtual environments as learning places. The communication is different. It is multidimensional. The are avenues of dialog that I haven’t even explored yet. I want to do this again, and with this experience behind me, I have a better sense of how to structure things. For instance, I spent a better part of yesterday morning (and the day before) re-acquainting myself with Linden Scripting Language, a fairly accessible programming language that you can use to design function into the objects you have built. I’ve found it useful lately, to include concept maps in my online handouts, as I am coming to depend much less on presentation software in my face-to-face presentations. 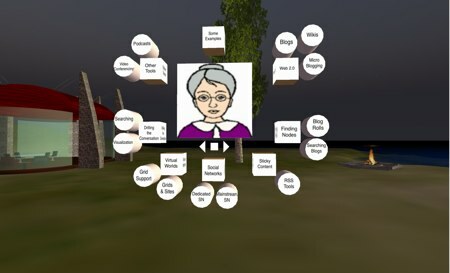 I wanted to take that to Second Life, but rather than a static graphical arrangement of signs, I needed it to build as I presented the ideas. To the left, you can see what it looked like during a trial-run on ISTE Island earlier in the day. It started with the image of Ms. Coolbeans surrounded by small dots. As I approached each of the concepts, I could click the appropriate dot, and it would expand into the box or cylinder for “Web 2.0,” “Finding Nodes,” “Sticky Content,” etc. Once expanded, participants could click the boxes to launch a web page, which aggregated related web sites out of my Delicious account. I had also figured out how to have each expansion of a box advance the slides in the middle (Ms. Coolbeans being the initial slide). But I neglected to protect the buttons that came with the free script that I hacked. So people kept advancing the slides on me, and I eventually ignored them and relied solely on my magnetic voice. No wonder I didn’t sleep well last night. You have to get swept up into the vortex of this thing to access the content. Not terribly practical to me, but it turns content into a place, and I think that this has potential. The best thing I could have done was to have folks break out into logical groups, and Lisa Perez and I discussed the possibilities before people started showing up. There really weren’t the facilities available to do that, making me wish I had acted on an impulse I’d had earlier in the day. The picture to the right is something that I took several months ago on ISTE Island. I do not remember the event or even the topic. But I do remember how the presenter was able to turn his content into place, that avatars/agents had to actually go to. My wish is to take the eight-legged concept map, and turn it into a building with eight wings. At the end of each wing would be a room where people could meet and talk about blogs, wikis, and microblogging; or techniques for growing your PLN; or tools for mining the conversation. If I’d had this, then I could have sent groups of avatars to the various wings to share what they know and what they want to learn. There could be slides, signs, and perhaps even dynamically aggregated blog postings related to the topic. I’d like to build a PLN Pavilion. Does anyone know where there might be some space for this?